AUBURN, NY — In many farm households, the husband handles all the finances while the wife may have little interaction with them. That’s why Mark Modzeleski, financial advisor with Legacy Wealth Advisors of New York in Syracuse, presented “Turning the Famine into a Feast” at the recent Central New York Regional Conference for Women. Modzeleski specializes in working with families and small businesses regarding retirement planning, wealth accumulation, and wealth transfer. Modzeleski said women should pay attention to their finances for several reasons. One is to have better security for the future. He shared that in 25 percent of divorces involve people over age 50, a rate that has doubled since the 1990s. Instead of looking forward to retirement with their husbands, these women may teeter on the edge of poverty because they don’t understand their financial picture. Even lasting marriages can’t guarantee a stable financial future for women. “More than half of women are not comfortable discussing their financial situation,” Modzeleski added. He hopes to help change that. Departing from and returning to the workforce for childcare or eldercare also reduces women’s earning potential, both in salary and cumulatively over the course of her career. Modzeleski said women often hold different goals for charitable giving than men. By understanding their finances, they can target the causes about which they care the most. Modzeleski added that according to the Family Wealth Advisors Council, by 2030, “women will hold two-thirds of the nation’s wealth.” Understanding how money works can help them retain and build on their wealth. Since most women can expect to outlive their husbands, Modzeleski wants them equipped to handle their finances effectively. As general health care and assisted care costs continue to skyrocket, women need to learn how to mitigate and prepare for the costs. He wants more women to feel empowered about handling money, beginning with identifying why they do what they do. “If you don’t understand your finances, it will be hard to understand your purpose,” Modzeleski said. He believes one’s purpose should intersect where passion, mission, vocation and profession meet. It’s important that it’s something one loves, the world needs, pays well and one is good at. 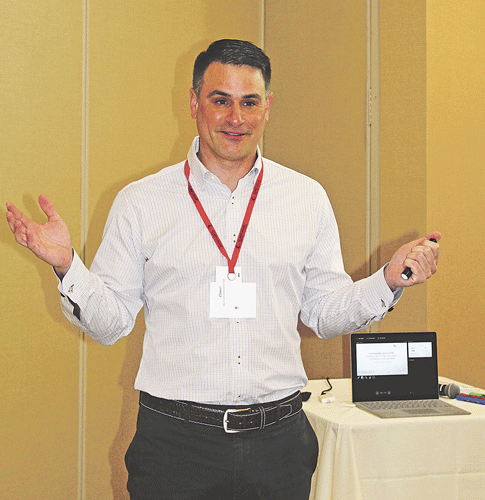 Although the process can be painful and less than successful at times, Modzeleski encouraged attendees to stick with it. He said it’s important to develop one’s own picture of success, which may differ widely from others’ picture. For a business, it may include sustainability, making money, leaving a legacy and providing employees with a reasonable lifestyle. For an individual career, it could also include making money, providing for the family, living a life of significance, giving to others and having a career and family. He compared it to juggling rubber balls — representing work — and glass balls — representing family, health, friends and integrity, based on a quote by Gary Keller. “Don’t ever drop one of those glass balls,” Modzeleski said. He calls 72 the “magic number,” meaning that if one takes an interest rate and divides it by 72, it shows how many years it will take to double. For instance, 3 percent interest takes 24 years to double. The average rate of inflation is 3 percent, so any investment that offers a lower rate of return actually loses money in terms of the person’s buying power. Modzeleski said women also need to plan on how long they may live after retirement. “You will need double the amount to live on by retirement,” Modzeleski said. A person who can pay all the bills with $3,000 a month will need $6,000 by then. Modzeleski said some people don’t worry about making only one or two percent interest. “Over a long period of time, a few percents of interest makes a big difference,” he said. Modzeleski said money could be used in three ways: safe, buy or invest. “Safe” may include a savings account and a low-interest savings vehicle. While these are secure, they don’t keep up with inflation. Buying could include business investments and real estate. “It is one of the only asset classes that costs you every year,” Modzeleski said. Business investment could include “things you need unique knowledge in to make money,” Modzeleski said. Cows, barns and farm equipment provide a few examples. Investing may include company stocks or U.S. savings bonds. “They’re pretty safe because they can raise taxes or print money to repay them,” Modzeleski said. Loans made to friends and family members may be riskier, “depending upon who you lend it to,” Modzeleski said. Stocks can also represent a way to grow one’s money; however, the learning curve can mystify some new investors. Modzeleski said many jump out of the market when it begins to go down and buy stocks that are becoming popular. Both are moves that are made too late. “It’s like going to Target and seeing something on sale and then coming back when the sale is over,” Modzeleski said. It’s far better to buy when stocks are low and staying patient, waiting for the market to improve, even if it experiences occasional dips. Women should also understand and plan for liability, death, disability and diversification. He also wants more farm business owners to think about their business structure, including the corporate structure, buy/sell agreements, and debt/personal guarantees. “They want a sustainable common purpose, build a team, determine the operating rhythm, set goals, set individual expectations and track performance,” Modzeleski said. To determine the company’s operating performance, business owners need to look at earnings before interest, tax, depreciation and amortization. The same holds true for farms. Part of a farm’s business plan should include planning for death, disability, departure or divorce of employees and what happens when these things occur. Farmers also need to watch debt versus leverage.